Long tours are no joke. It is just you and what you can carry on the road. For those who have been on such a ride, you know well the importance of carrying what is necessary for every occasion. Paramount on that list is footware. I know, I know… helmets and jackets are usually at the top of everyone’s list, but if you have ever done a lot of miles in wet shoes, you will understand. That is an avenue that the Alpinestars Mono Fuse Gore-Tex Boots look to fix. As an ideal touring solution for those who spend a lot of time on two wheels, these boots offer a full grain leather outer shell and Gore-Tex lining for all weather conditions. With a TPU buckle system that utilizes a ratchet closure system for superbly stable fit and extensive instep and accordion flex zones for top-tier comfort. Additional features to maximize functionality can be seen in in the hot-melt shin plate, TPU shift pad, and double density ankle protectors. 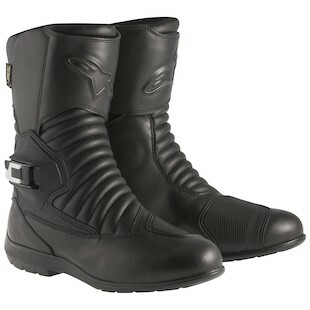 So if you are a rider looking for a comfortable, all seasons boot that is good both on and off of the bike, check out the Alpinestars Mono Fuse Gore-Tex Boots.